TAMONTINA USA has been making quality products since 1911 starting in Brazil. This beautiful and high-end cookware is assembled in Texas, USA, with imported handles and lids where they are packaged and sent to distributors. 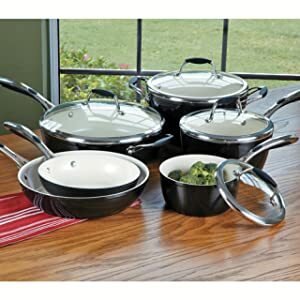 The heavy-gauge model number 80110/525DS 10-Piece Gourmet Ceramica 01 Deluxe Cookware is porcelain enameled aluminum with cold-forged heavy-gauge aluminum construction, will give you the even heat distribution when you are cooking. This lovely set is a porcelain enamel black metallic color on the outside with an ivory white porcelain enamel interior. Performance and Features. The interior coating is PTFE-PFOA, lead-and cadmium-free having no toxins. The handles are designed to fit your hands perfectly with a soft grip made of cast stainless steel covered with silicone The tempered glass lids will not break from heat or shatter. They are clear so that you can see what’s cooking. The cookware is dishwasher safe and can be used in the oven up to 350-degrees F. You can safely use them on electric, gas, and ceramic glass cooktop stoves. Do not use under the broiler. High heat will discolor and damage your cookware and void the warranty. Do not use abrasives, scouring powders, steel wool soap pads, or brushes on the cookware. Protect the inside surface during storage. Do not stack (nesting) your pots on each other. Use paper towels, cloth towels, or purchase cookware protectors. The TRAMONTINA gourmet ceramic 01 deluxe set is one of the gourmet collection series of premium products. Designed, engineered, and manufactured to the highest of standards using the finest materials by the finest craft teams with superior workmanship, these pans will fulfill your cooking desires. This product line surpasses others in the marketplace. You will have the best value for the money. Professional chefs and cooking aficionados both agree this is quality and esteemed cookware. This fantastic set includes an 8-inch fry pan, a 10-inch frypan, an 11-inch diameter deep skillet, a 1.5 quart covered saucepan, a 3-quart covered saucepan, and a fabulous 5-quart covered Dutch oven. Seasoning the porcelain enamel is a snap. Put a small amount of cooking oil, olive oil, or coconut oil into the bottom of each cookware piece. Rub the oil around the surface. Put the cookware over medium heat for 2 to 3 minutes. Let it cool to room temperature. Wash with warm soapy dish detergent, rinse, and towel dry. Your cookware is now ready to use. Do not use Pam or other nonstick aerosol oil cooking sprays. Use only on low to medium heat with nylon, silicone, wood, or bamboo utensils. Metal will scratch the cookware. Do cut food in the skillets or pans or use mixers and beaters. Gift-wrapping is available and the products come with instructions, a User’s Manual and a Lifetime Warranty.